It’s a peculiarly Pensacola tradition. Once a year, tens of thousands of people gather on the sparkling beaches of Perdido Key for the purpose of throwing dead fish into the state of Alabama. No, this isn’t some bizarre interstate rivalry. It’s the Flora-Bama Lounge’s annual Interstate Mullet Toss and Gulf Coast’s Greatest Beach Party. Now, when we’re talking mullet in this context, it’s not the “business in the front, party in the back” hairstyle. While you may see a few of those on the beach over the weekend of April 27-29, this event is strictly no business, all party. No, the mullet I’m referring to is the breed of fish you’ll be pulling out of a bucket of ice water to use as the ball when you do your best Tom Brady impression. And there’s no “Deflate-gate” here because all of these fish are pre-deflated — they’re already dead. So why has the Flora-Bama — an iconic Gulf Coast roadhouse situated just on the Florida side of the Florida/Alabama state line — been hosting the Mullet Toss for more than 30 years each April? The competition is really an excuse to throw an epic, weekend-long beach party that has become a highlight of the local calendar as it continues into its 34th year. In addition to the competition — which raises more than $40,000 annually for local youth charities including the Community Drug & Alcohol Council Inc. — the weekend is filled with fun on the sand and in the surf, classic ladies’ bikini and men’s hot-bod contests, frosty adult beverages, great food from the Flora-Bama’s three restaurants and a boatload of live music. 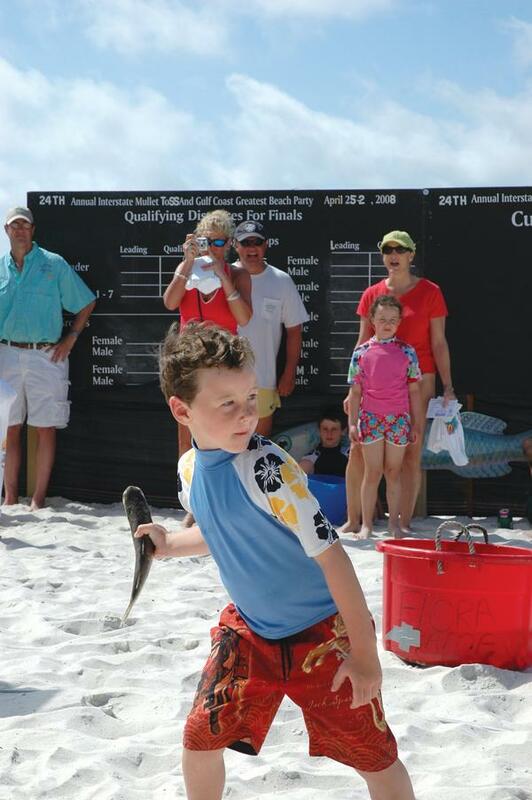 And no, you don’t have to throw a fish to have a great time at the Mullet Toss, but why wouldn’t you? You get to support a good cause and take home a souvenir T-shirt. And if you throw your fish far enough, you could be one of the six daily finalists. There’s a $15 charge to fling your fish, over and above the Flora-Bama’s cover charge. Some important rules you should know before tossing a mullet: You’re throwing from a 10-foot circle down a designated alley from Florida into Alabama. If you step out of the circle, your toss is disqualified. If you throw out of bounds, you’re also disqualified. You’ll select your finny friend from the bucket, and no gloves are allowed. Rubbing sand on your mullet is also a no-no. Once you’ve thrown your fish and your distance has been recorded, pick him up and return him to the bucket. 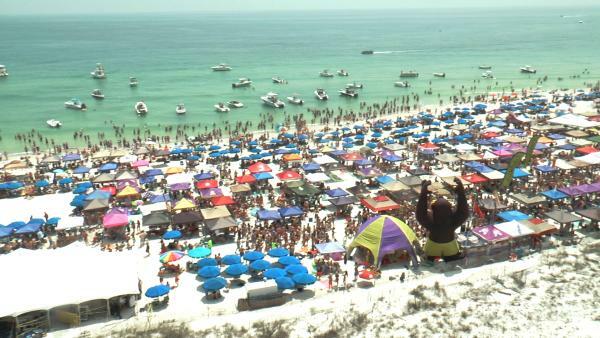 Gates open at 10 a.m. daily but be forewarned that traffic to and from the Flora-Bama will back up very quickly, and there is very little on-site parking. Typically, the Bama offers shuttle service to the grounds from locations on both sides of the state line to help alleviate the traffic, but this is a hugely popular event, so be patient. You should also know that while you’re welcome to take beach chairs and tents onto the beach during the event, outside coolers and/or alcohol are not allowed. 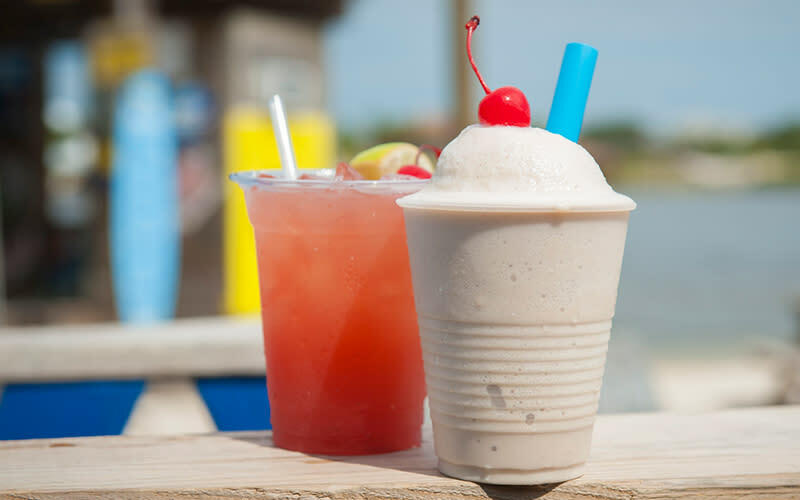 Don’t worry, the Flora-Bama will have plenty of libations available, including small coolers of beer to take beachside. Also, no personal amplified music will be allowed on the beach, but Red Bull will provide beachside music. Inside the Bama, live music will be heard all weekend long from three stages. For more information, including cover charges and shuttle information, visit www.florabama.com.